Full disclosure. I would like to tell you my Tiger Woods story. It’s timely and juicy and good, I promise. But here’s the hitch, it’s not entirely Happelsauce worthy. I mean, this is a food blog, not The Superficial. I figure that I need a good recipe to accompany my true Tiger tale, so recently my mind got to churning. What recipe could I possibly associate with Tiger Woods? My brain played a far-reaching game of connect the dots. I was in the shower yesterday when I recalled one of my favorite bedtime stories when I was little. It was called Little Black Sambo. (Please note: At the time, I was unaware that it was such a controversial book. It was first published in 1899. According to Wiki, it may have contributed to the use of the word “Sambo” being used as a racial slur, for crying out loud!) But, in the book, Sambo is the protagonist and the Tigers are the greedy antagonists. See where I’m going here? In case you haven’t read it, it’s the tale of a boy named Sambo who gets repeatedly threatened by hungry tigers and ends up giving them all the new, colorful clothes off of his back so they don’t eat him. Sambo cries, feeling utterly alone and defeated by the greedy tigers, when he hears a horrible “Grrrr” in the distance. He finds the tigers fighting each other over who’s the grandest tiger of all. They “caught hold of each other’s tails” and ran so fast around a tree, they became a blur and melted into butter. Sambo’s father stumbled upon the golden butter on his way home from work and brought it back to his wife that evening. She used the butter, “just as yellow and brown as little Tigers,” to make an enormous batch of pancakes for her family. Dots connected! Pancakes and greedy tigers. 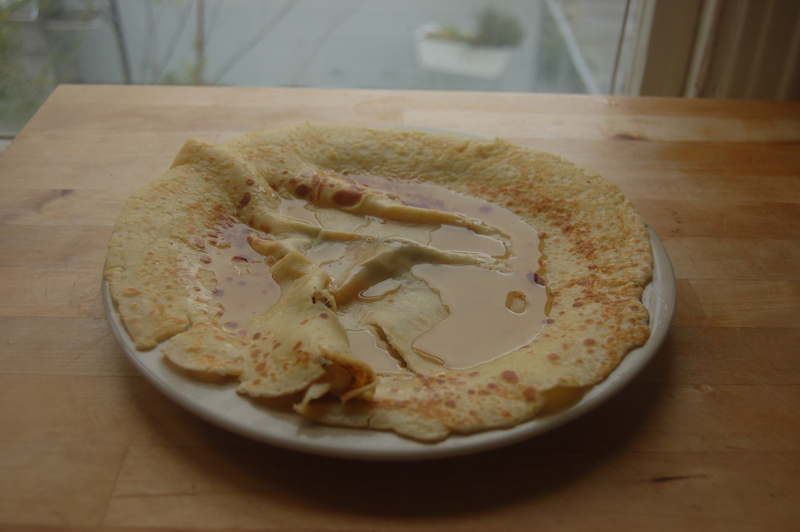 Good news is, one of my absolute favorite breakfasts of all time are pancakes…Swedish pancakes, at that. Oh yes. Pom would channel her inner-Swede and make them on the occasional Sunday morning, inevitably making my day. They’re thin and egg-y and taste like heaven. I’ll post the recipe below. Please make them! But, don’t head to the store to buy eggs and milk for the batter quite yet. I’ve rambled enough. It’s finally time for my true Tiger tale. Thanks for bearing with me. Over 4th of July weekend in 2006, I met up with Lex, Allie and Katie in Las Vegas. It was my first time visiting as an adult. I’d been there once before with my family when we were on an epic canyon tour throughout the southwest. I think I was 12. I remember the endless breakfast buffet at The Mirage and not much else. On my first night in Vegas with friends, we ventured from our room at the MGM Grand and ended up at the Bellagio. It wasn’t until after dinner and a couple bottles of wine that I realized I’d left my ID in our room, on the other end of The Strip. Crap. I couldn’t get into a club without it. And it was our first night in Vegas! Dancing at a club was next on the agenda. I urged Lex and Allie to have fun without me while cursing myself for putting a damper on our escalating Vegas momentum. I suggested that I wait for Katie to arrive (her flight was delayed leaving Seattle). She would drop off her bags in our room, grab my ID and then the four of us could rendezvous. But, Lex and Allie, being the most excellent of friends, insisted that we stick together. So we walked out the sliding glass doors of the Bellagio and parked ourselves on a faux marble bench to wait in the 102 degree heat. It was a little after 11pm. A friendly hotel valet/bellhop wandered over and started chatting with us. We were the only people outside and we were losing steam. He eventually walked off to attend to an approaching car. A few minutes later, he hollered at us from the other side of the road, “Ladies! Ladies!” And motioned with his arms to come his way. We had no idea what he wanted. Again, I urged Lex and Allie to go and they insisted I come too. We headed in the valet’s direction. He was standing next to an unmarked door on the side of the casino. We approached and were greeted by a familiar face at the door…Tiger Woods. “Hi, I’m Tiger.” We all made introductions and shook hands. Then we followed Tiger and his two friends up the dark stairway, through the back entrance and to the VIP booth at Light, the club at the Bellagio. Vodka and cranberry juice appeared on the table. Tiger lit a cigar. He wasn’t friendly, but he wasn’t rude either. He seemed relatively void of emotion and interest. Neither Lex, Allie or I said much to him. We learned from his childhood friends that they were in Vegas to celebrate a 30th birthday. I mixed a drink, exchanging wide-eyed glances of sheer amazement with Allie and Lex. Our first night in Vegas and we were hanging out with Tiger Woods in his VIP booth. Really? Another drink, more observations. I knew that Tiger was married, so why was he letting the cocktail waitress sit on his lap? I’m naive, I guess, but I didn’t expect it. Another drink, Tiger left the booth. Another drink, and I promised myself that if and when he returned, I would talk to him. Where had he gone, anyway? And where was the cocktail waitress? Katie had arrived at that point and was hanging out with us and Tiger’s friends. An hour or so later, I was feeling bold and bossy from the vodka coursing through my veins, and Tiger returned. It had to have been around 2am at that point. Tiger’s star power had worn off. He hadn’t smiled all night. Here was a guy who seemingly had everything in the world, and he seemed sad. “Tiger, are you happy?” Yup, I said it. He asked me to repeat the question a few times. More than twice. And finally his answer was, “I have everything I want.” From afar, Tiger does seem to have everything – Fame, Fortune, Family. But happiness? Maybe that’s the intangible element he’s never known to strive for. Maybe because he always thought it came bundled with the three F’s. Or, even worse, maybe he never considered happiness as something to strive for in the first place. I don’t know. Happiness is a function not so much of our circumstances as of our perceptions. I think Tiger should ponder that sentence and then he should set off on his road to happiness by making a big batch of “Tiger’s Swedish Pancakes” for Elin and the kids. How about that? Lightly beat the egg yolks in a large mixing bowl. 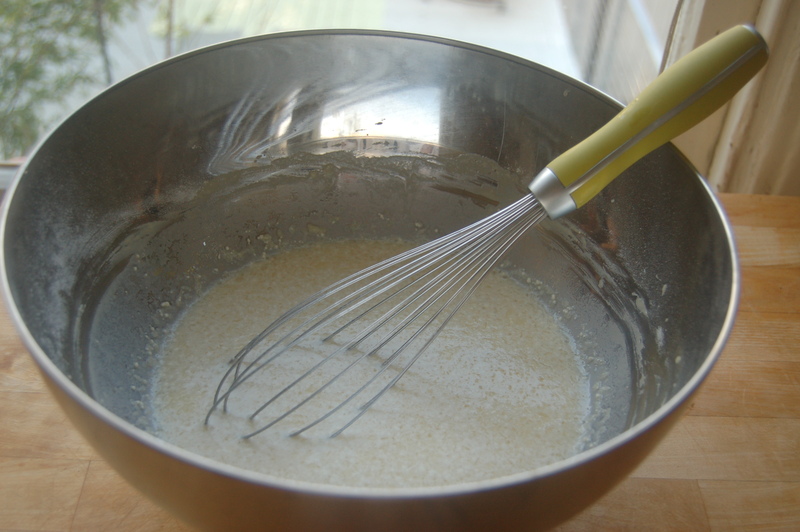 Add 2 cups of milk, sugar, salt , flour and whisk free of lumps. Stir in the remaining 2 cups milk and melted butter. Batter will be very thin. Pour about 2/3 cup batter onto a lightly buttered large skillet over medium-high heat. 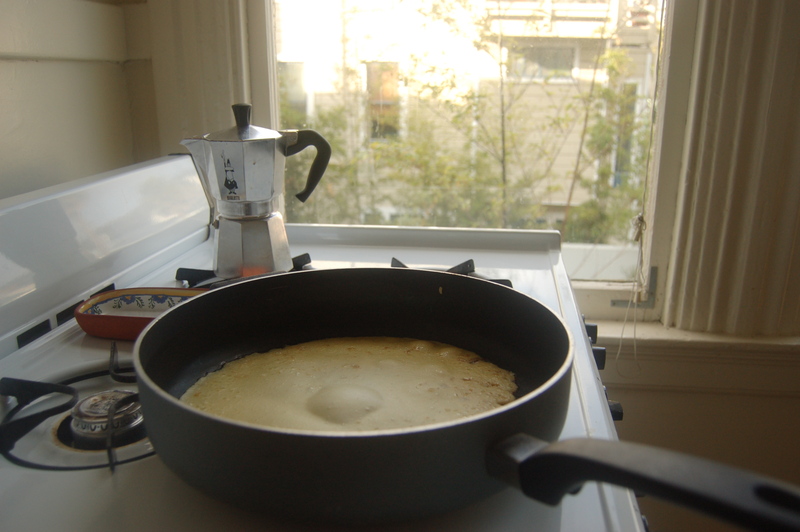 Loosen pancake all around with a spatula and flip. (Rumor has it that it helps if you’re Swedish.) Remove from skillet and repeat until batter is gone. Fold pancakes in half and keep warm in a 200 degree oven. Serve with lingonberry jam, pure maple syrup, or a light dusting of granulated sugar and a touch of milk. No way!! this is an incredible story. your first words to Tiger are “are you happy?” That’s about the boldest thing I’ve heard in a long time. I bow to your boldness. Will eating these pancakes make me as bold as you? Hi Talley! I love your blog! If you wash the pancakes down with vodka, then yes! They’ll make you very bold…. i love the way you tell this story to much and the way you relate it all to pancakes! i also love the quote you included. love you annie! um, you need to sell this to in touch weekly. then you could make elin pancakes til your eyeballs pop out. i love you anita. i’m glad i wasn’t there. i most likely (after a few cran vodkas) would have given tiger a few memories he would soon forget…namely pole dancing to some fergie tune or hitting on the hot cocktail waitress in order to save his rep. aimee!! i love you and your honesty. but wouldn’t you have been pole dancing to usher? come on now!! Anno! I read this last night from my bed. I then dreamed that I made my own batch. 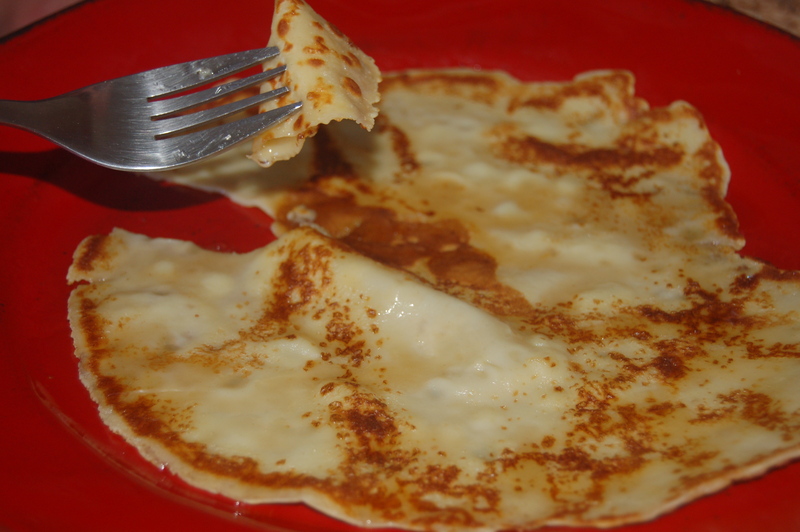 Swedish pancakes are sooooo delicious. Cheers to all people channeling their inner-Swede. I have a little bit of an obsession with various kinds of pancakes/crepes, so I’ll definitely have to try this!